Many of our web pages may use ‘cookies’. These are small text files that we place in your computer's browser to store your preferences. They do not tell us your email address or other personal information unless you choose to provide this information to us by, for example, registering for further information. If you choose to provide personal information this may be linked to the data stored in the cookie. A cookie is unique to your computer and can only be read by the server that gave it to you. You can configure your browser to accept all cookies or to alert you every time a cookie is offered by a website's server. Most browsers automatically accept cookies. You can set your browser option so that you will not receive cookies and you can also delete existing cookies from your browser. You may find that some parts of the site will not function properly if you have refused cookies. Please be aware that if you do not configure your browser you will accept cookies provided by this website. No documents, photographs or related graphics on AXLR8 CIC site are to be modified in any way; graphics on the site are not to be used separately from the accompanying text and no part of the site may be reproduced or stored in any other website or included in any public or private electronic retrieval system or service without prior written permission from AXLR8 CIC. Access to and use of the site is provided by AXLR8 CIC, subject to the following Terms and Conditions. 1) Use of the site constitutes your acceptance of these Terms and Conditions, which take effect when you first use this site. AXLR8 CIC reserves the right to change these terms and conditions at any time by posting changes online. 2) AXLR8 CIC endeavours to ensure the site is normally available 24 hours a day, but will not be liable if for any reason the site is unavailable at any time or for any period. 5) AXLR8 CIC does not accept any liability for error or omission. The company shall not be liable for any damages (including, without limitation, damages for loss of business or loss of profits) arising in contract, tort or otherwise from the use of or inability to use the site, or any material contained in it, or from any action or decision taken as a result of using this site or any such material. 6) AXLR8 CIC accepts no responsibility for the content of any site to which a hypertext link from the site exists. Such links are provided for the user’s convenience on an "as is" basis with no warranty express or implied for the information provided within them. 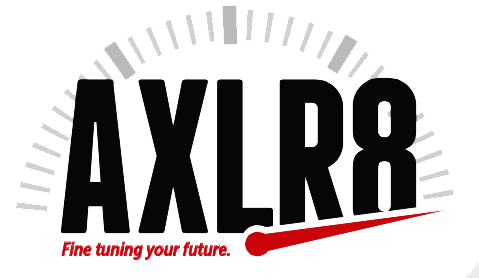 AXLR8 CIC takes the privacy of your information very seriously. By using our website (the Site) and any services we offer via the Site, you are agreeing to be bound by this policy so if you have any queries about the policy, please contact us via the Site or by telephone. You do not need to provide personal information when visiting the Site and we will only store non-personal access information, such as the name of your Internet service provider and the page from which you are visiting. This information is only analysed for the purpose of improving our service. Personal information is only collected if voluntarily provided. We will use the information you supply without separate consent only to complete and process your order. Your details will be needed if you request a newsletter but this will include an ‘unsubscribe’ option. We secure our website and other systems against loss, destruction, access, modification or distribution by unauthorised persons through technical and organisational measures. Please keep your access information confidential, and close the browser window once communication with us has ended. We aim to keep our information about you as accurate and up-to-date. You can contact us to review these details and discuss how they are stored at any time. It is also your right to receive information free of charge about the data stored about your person, as well as a right to correction, blocking and deletion of this information if necessary. You may withdraw your consent at any time, with immediate effect. If you agree to receive interesting offers by regular e-mail, your details including email address will not forwarded to other parties.